It was a beautiful Saturday Morning while driving to the Frisco Commons Park – we caught a glimpse of the big orange Sun. On reaching — the Frisco Commoms Park, we were amazed at the location , most of us never expected such a beautiful park in the city. It looked like the most perfect setting for the 5K Walk – another blessing from Nature. It was wonderful to see young kids from 2yrs to grandparents walk in with smiles and all ready to go. 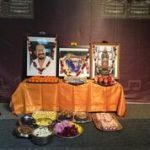 At around 7:15 AM – with God’s grace and Sri Swamiji (in the form of His portrait) taking the lead we began walking, chanting all the time. To our surprise all the kids wanted to join the walk and even took the lead, no one stayed back in the play area. 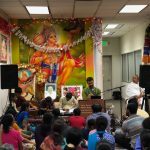 It was indeed wonderful to see everyone and hear the Mahamantra from everyone all along — it seemed that God had just planned the perfect day. Walking along the way – through a canopy of trees, couldn’t cease to admire God’s creation. Many great moments when the little girls overtook each other competing to finish first and the enthusiasm with which the Grandparents wanted to complete the Walk however long it took. But above all, it was wonderful to hear everyone join and chant the Mahamantra – even if they were out of breath racing to finish. The last quarter mile – we all waited for each other and walked together again, chanting – could really feel everyone coming together. It was wonderful, we couldn’t have had a better way to start the morning. A wonderful breakfast with fruits lay ahead of us – with our enthusiastic kids to help serve, we had a refreshing breakfast before we headed to the Hanuman Temple. The orange Sun had turned yellow and it was perfect timing to be at the Hanuman Temple. Hanumanji had given us an opportunity to chant the Mahamantra for a friend’s son, who was in ICU at the Childrens hospital. 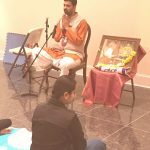 Following our Guru Maharaj’s path – Mass Prayer and Mahamantra chanting Dallas GOD members began chanting the Mahamantra. Everyone visiting the temple that day followed the same. There was also a Blood Drive outside the temple – to help collect blood for our friend. It was amazing to see how many volunteers we had for the blood drive and how people helped in different ways to get it all together in just 2 days – that was truly Hanumanji’s blessings , a mobile blood donation drive takes months of advance notice , truly Gods grace, a miracle. From the Hanuman temple we all headed for our weekly Satsang – keeping our friends health foremost in our thoughts. Again wonderful to see everyone chant after a long day of events. It was truly Guru Maharaj’s grace – we were trying to plan an entire day to chant and couldn’t decide when and how. During the Satsang we all felt the flow of events and we couldn’t have planned a better way to chant,pray and stand together to help our friends and community. The Divine had planned it together and gave us this wonderful opportunity! 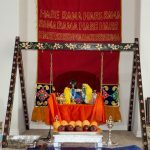 In all, about 60 devotees joined the 3.2 mile long Namathon in the morning and about 100 people were present during the mass Mahamantra Kirtan at the Hanuman temple and the strength rose to 250 by the time it concluded! 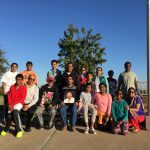 2 Responses to "Naama Walk in Dallas Metroplex"
Jaigurunath!Let Our GuruMaharaj’s Glory Spread every single Corners of the World !.. Humble Pranams to everyone’s feet who does these Kainkaryams ! my heart feels so happy to read this. Guruji says in his song ” ulagam raiyachieven ena sapatham seithare” . He vowed that the hare rama nama will be spread all over the world. the days are not far away . 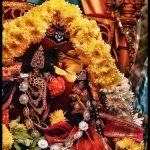 my pranams to all devotees who sand , heard and participated.